Power management company Eaton announced its eMobility business has developed compact power-dense automotive inverters capable of increasing the range of electric vehicles. The inverters, which draw electricity from the battery and control how it is applied to the motor to manage power and torque, will be tested by a global automaker in the first quarter 2019. Leveraging Eaton's expertise in high-voltage power management, eMobility developed the vehicle inverters with a power density of 35kW/liter and 98 percent operating efficiency. The inverter's high-power density and compact, lightweight design help maximize range while taking up minimal space in the vehicle. "Most global automakers have different vehicle electrification strategies, so the products we develop must support a range of applications. Regardless of the strategy, electric vehicles need efficient and compact power electronics, and our new line of efficient inverters can be tailored to a wide range of customer requirements and applications," said Scott Adams, senior vice president, eMobility, who also noted Eaton's inverters provide best-in-class performance with power-dense packaging that is powerful and adaptable. "The inverter market for electric vehicles is still emerging," Adams said. "Among our advantages in this market are our established partnerships with key suppliers of power electronic components and the fact that our inverters comply with the critical ISO 26262 standard for functional safety." 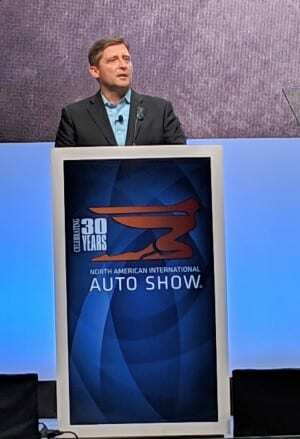 Adams spoke at AutoMobili-D as part of the 2019 North American International Auto Show, January 17, in Detroit, Mich., where he discussed Eaton's perspective on the electrified vehicle market. Eaton projects xEVs will increase to 38 percent of the global passenger car market by 2030, with share dispersed among battery electric, plug-in hybrid, hybrid-electric and mild-hybrid electric. Eaton's inverters can be used in all types of electric vehicles, as well as other alternative fuel vehicles, such as hydrogen fuel cell cars. On The Web: Eaton Corp.